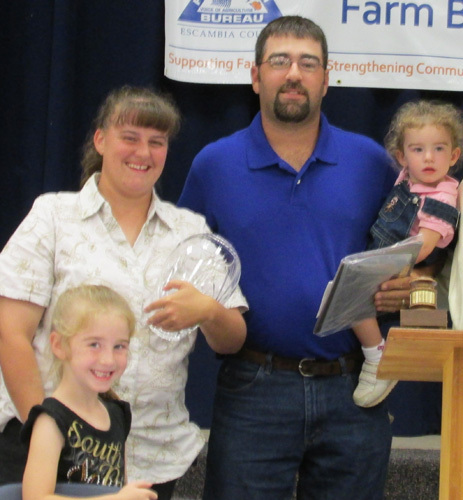 The Matt Carter Family has been named the 2013 Escambia County Outstanding Farm Family. Matt has been married for eight years to Dawn, and they have two girls — six-year old Emily and almost-two Jayden. They work together on their farm on Byrneville Road to being the freshest, highest quality vegetables direct to local consumers at their Matt’s Produce stand and weekly at the Palafox Market in Pensacola. Matt grew up working alongside his father, Lance Carter at Crary Dairy. As a youth, he was a member of the Northview FFA chapter and was chapter president. He is still very active in supporting agriculture as a member of the EscaRosa Young Farmers and Ranchers. For a number of years, he worked off the farm at the West Frazier Sawmill. But when it closed in 2008, he saw the opportunity to open his own farming operation. He saw the interest for local produce steadily increasing and knew that he wanted to be a part helping to supply homegrown vegetables to Escambia County resident. His business started small with tomatoes, squash, cucumbers, and zucchini which he sold at the farmstand on Byrneville Road, but quickly joined the Palafox Market to sell his product. Over the past five years, the Carters have expanded their operation both in acreage and product variety. Throughout the year, Matt and Dawn produce peppers, tomatoes, squash, potatoes, onions, zucchini, turnips, mustards, collards, cabbage, broccoli, cauliflower, peas, and butter beans. Future plans included a certified kitchen at the product stand so they can sell value added items straight to the consumer.